To start with there's a familiar view in an unusual way, the Paps. Then of course there's lslay, to where they were travelling at Warp Speed. 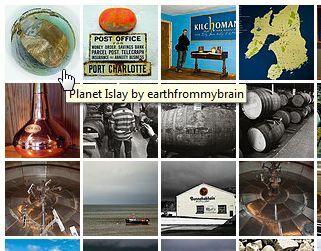 Obviously there's the previously mentioned Planet Islay. Considering the many miles they must have covered it's good to see they Still Love Cycling. A nicely presented dram of Bowmore. On to the south coast The bikes | Laphroaig doesn't tell the whole story, as it leaves me wondering what kind of car that is? Back in Port Charlotte there's an Amazing Beer Garden and another typical view of Islay. Then it's time to say good bye via Port Ellen and past Laphroaig and Lagavulin. Last but by no means least is a rather interesting picture of the Eileanan Innse Gill - the short one!